Cervinia is a high, snow sure resort with links to Zermatt. Most of the accommodation is either hotel or apartment based. We have an excellent Chalet Hotel there called the Dragon and the Club Med is our best seller. The centre of the resort is pedestrianised and is lined with bars restaurants and little Italian boutiques. Cervinia has been making great efforts in recent years to soften its image, particularly in the centre. Many of the buildings built in the 60’s have been reclad in wood. 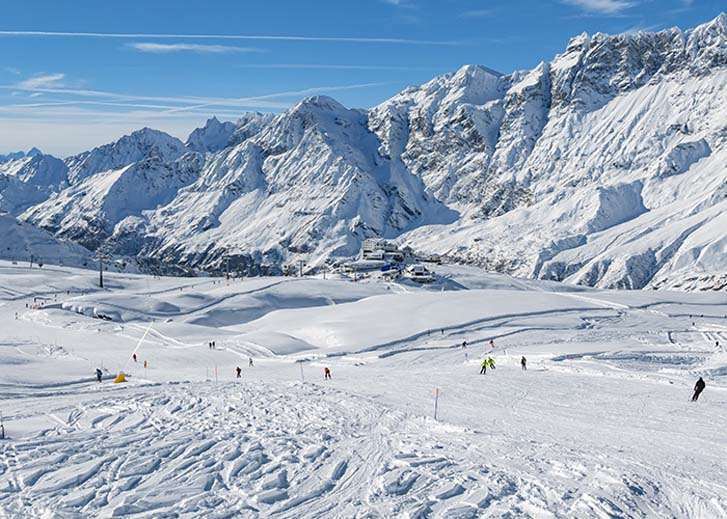 The skiing is predominately suited to beginners and intermediates, advanced skiers can find some interesting runs particularly down towards Valtournenche. Beginners start on the village nursery slope and then can progress upwards and outwards to most areas of the mountain. Intermediates really have the run of the whole area and should not find anything which is beyond their capability. The link to Zermatt opens up a huge skiing area but is regarded as more useful for those based in Zermatt looking for an enjoyable cruise into Italy for lunch. 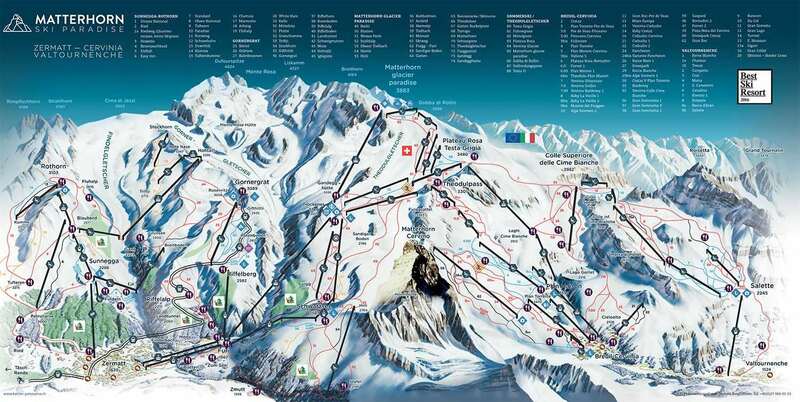 The Breuil-Cervinia Valtournenche Zermatt is one of the highest and largest ski areas in the Alps. With Cervinia sitting at 2050m and the ski area peaking at 3883 m, it is one of the most snow-sure resorts in Europe. 200 km of piste has snow guaranteed and 26.5 km is open for summer skiing thanks to the elevated altitude. There are snow making facilities located on the lower part of the mountains so that skiers can take advantage of skiing the whole mountain throughout the season. Cervinia’s après ski is lively centred around the numerous bars in the centre. There are some good discos to chose from, including the Garage, which has minibuses to drop you home at the end of the night. Cervinia is the perfect place to take your family skiing. For the more nervous skier they can enjoy the easier slopes in Cervinia with wide open runs and limited dangers on either side of each piste. For the more adventurous skier they can find more challenging slopes on the Zermatt side. The high altitude resort means they can offer a natural ice rink, great for families to enjoy. Cervinia being snow-sure is a real attraction for early and late season skiing. There are plenty of restaurants and pizzerias to keep family fuelled, shops to buy new winter gear and there’s even bowling if you’re looking for something to do in the evening. The variety of slopes they have in Cervinia is great for groups. Skiing on the glacier offers plenty of beginner and intermediate runs which means the more novice skier in a group can easily meet up with rest in one of the mountain restaurants. Cervinia is much cheaper than it’s neighbour Zermatt (Switzerland), which means that you find a holiday that fits a lower budget making it inclusive for more people to afford to go if you’re the leader trying to organise a large group. The Italian affordability means you can also have a few more drinks in the evenings as your pound travel a bit further compared to the Swiss side! For the wine connoisseurs you’ll have access to some amazing wines in the resort whether in the supermarket or restaurant, with Cervinia being Italian it’s located not far away from some fine wine making areas for you to enjoy. It is also a short transfer from Turin to Cervinia, just 1 hour and 45 minutes, which goes down a treat when organising a group ski holiday. The most convenient airport for Cervinia is Turin which is accessible via car or bus transfer and takes around 1 hour and 45 minutes. Known more as 'The Italian Secret' Cervinia is one of the more popular Ski resorts for the Italians however in recent years it has seen more British families and Russians make the trip to the top of Mont Cervino. The village is very quaint with many restaurants and shops. I can highly recommend the restaurant 'Jour et Nuit' especially if you love your good quality red meat and fine wines. The Village has 2 ski lifts and a junior nursery slope along with a Gondala to the main Ski area of Plain Maison where you have access to the entire mountain. From Cervinia you can ski over the mountain to Zermatt or across to Valtournenche. All in all I believe that this is a superb resort for the family and beginner/intermediate skier. There are some challenging black runs in the resort however there are many more on the run down to Zermatt. Well worth a visit, and a guaranteed snow resort! Known more as 'The Italian Secret' Cervinia is one of the more popular ski resorts for the Italians; however, in recent years it has seen more British families and Russians make the trip to the top of Mont Cervino. The village is very quaint with many restaurants and shops. I can highly recommend the restaurant 'Jour et Nuit' especially if you love your god quality red meat and fine wines. The Village has 2 ski lifts and a junior nursery slope along with a gondola to the main ski area of Plain Maison where you have access to the entire mountain. From Cervinia you can ski over the mountain to Zermatt or across to Valtournenche. All in all I believe that this is a superb resort for the family and beginner/intermediate skier. There are some challenging black runs in the resort however there are many more on the run down to Zermatt. Well worth a visit, and a guaranteed snow resort!! !